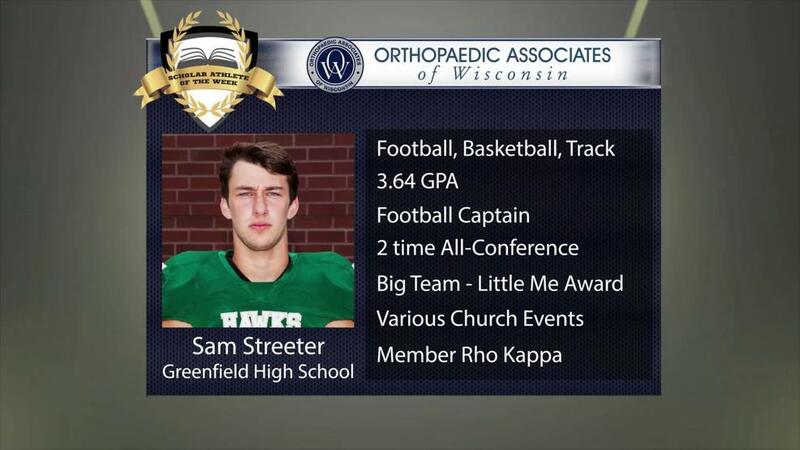 Sam has been a tri-sport athlete during all four years of his time at Greenfield High, participating in Football, Basketball, and Track & Field. He has excelled on the football field, leading to holding the title of Captain, being named to 1st Team All-Conference twice, and receiving the "Big Team - Little Me" Team Award. Sam carries a 3.64 GPA, participates in various church events, and is a member of the Social Studies Honor Society, Rho Kappa. Congratulations to Sam Streeter for being named one of this season's scholar athlete nominees. At the end of the season, one nominee will be chosen to receive a college scholarship courtesy of Orthopaedic Associates of Wisconsin. When it comes to quality orthopedic care, as Orthopaedic Associates of Wisconsin will show you, There is a difference.